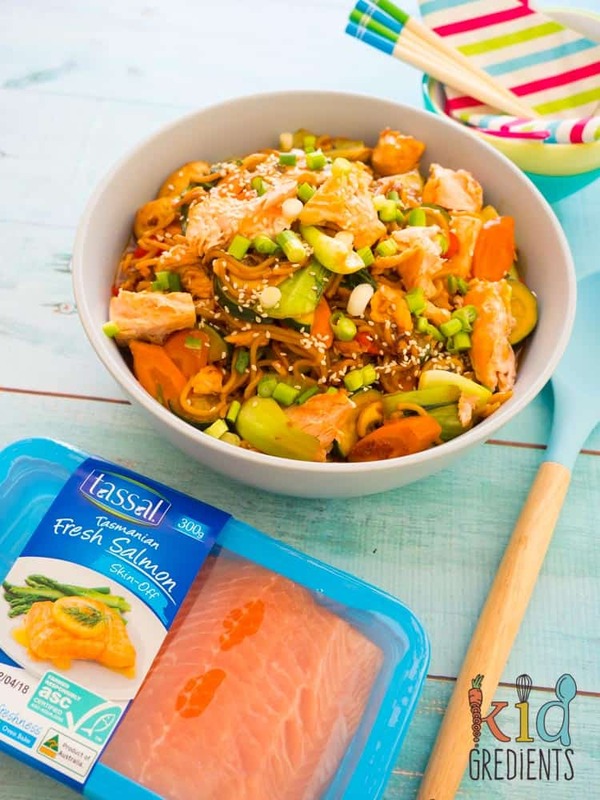 This honey soy salmon and veggie stirfry is sponsored by Tassal Salmon. When it comes to making weeknight dinners delicious, it’s so important that the meal is quick, yummy and full of good fresh food. 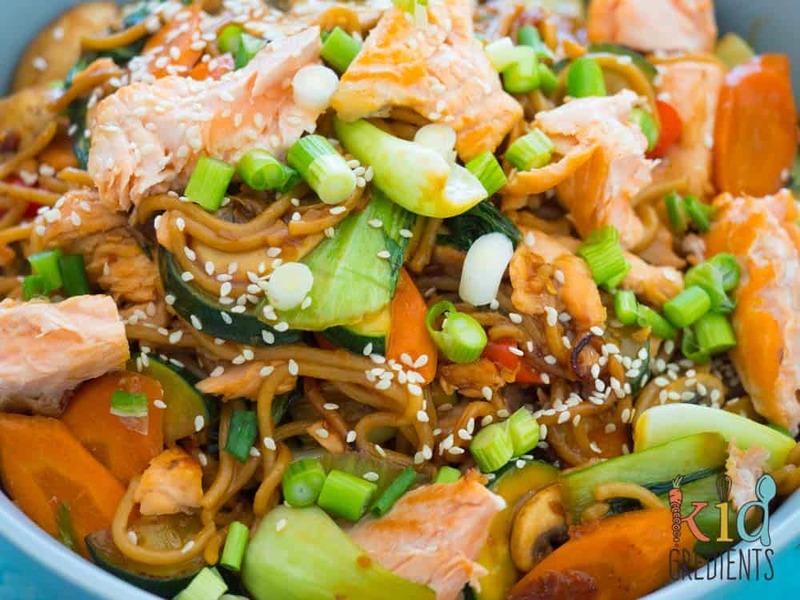 That’s why this honey soy salmon and veggie stirfry is such a winner! You’ve probably already seen that I’m working on a series of salmon recipes. We’ve done salmon sandwich sushi and salmon panko bites (these are a favourite for mid week dinners too!). We all just seriously love salmon at our house! Aussies love a good stirfry, it’s the ease, how quick they are to make and the fact that there are ready prepared strifry packs of veggies in the supermarket that cut the prep time of the veggies right down. If you would prefer to use one of those instead of the veggies in the recipe, go ahead! 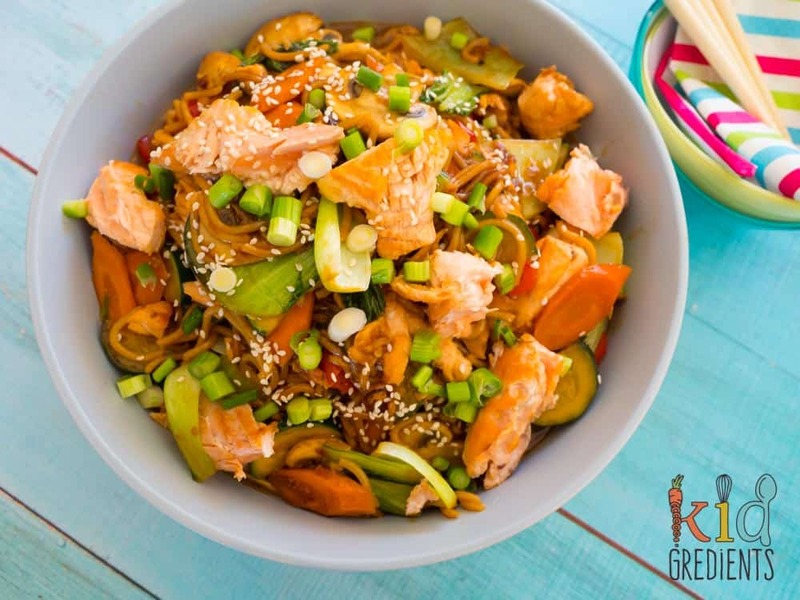 Salmon makes a stirfry even easier and even better for you! Salmon is such a great choice as a protein for growing families. In fact, it’s one that you can easily pop into your regular meals. Salmon packs in the Omega 3 fatty oils but also contains a whole host of other goodness in the form of 42% of your daily protein requirements (from just 100 grams)vitamin D, vitamin B6, vitamin B12, phosphorous, magnesium, potassium and selenium. 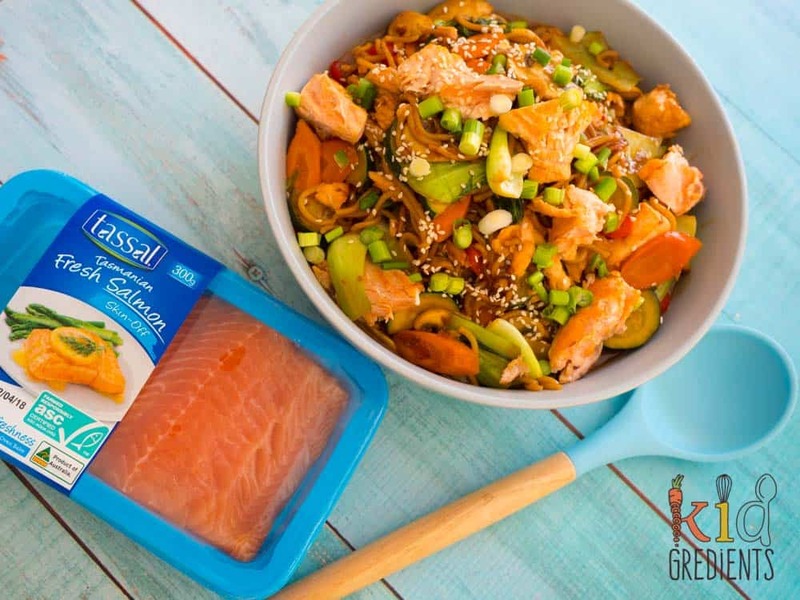 You don’t have to go anywhere special to buy it either, the blue packs of Tassal salmon you’ll find prepackaged in the supermarket are as fresh as it gets! So what are you waiting for? 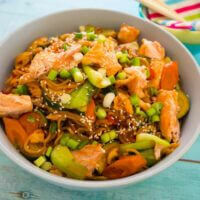 Make this honey soy salmon and veggie stirfry your dinner of choice this week. 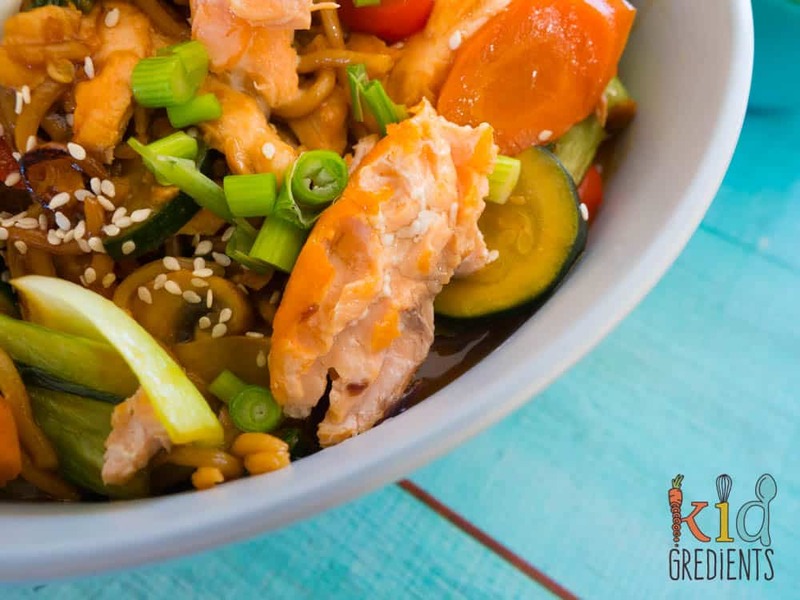 Honey soy is always such a kid friendly flavour, my kids love the combination and in fact, it helps me get away with a whole heap of veggies that normally wouldn’t be so easily gobbled! 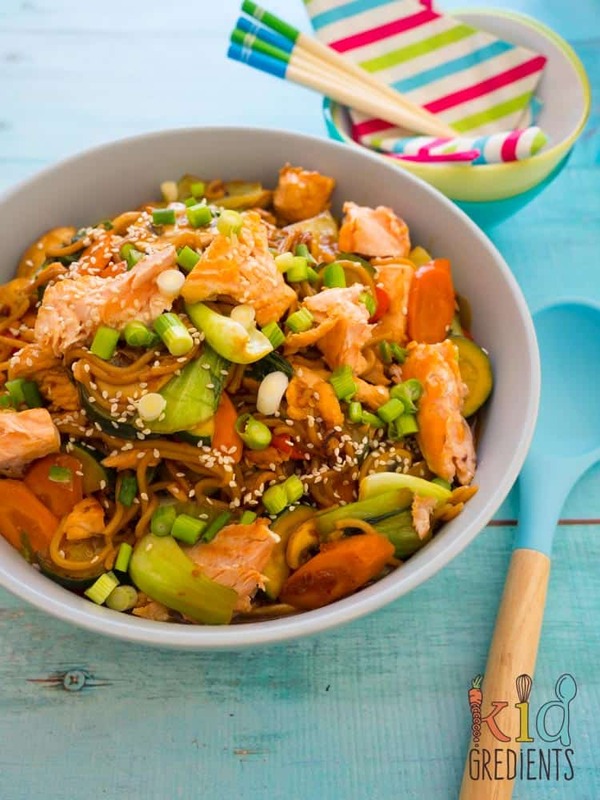 This yummy honey soy salmon and veggie stirfry is fantastic for a midweek meal! Place the noodles in a bowl of boiling water and allow to sit for 5 minutes. Drain and put aside. Combine the garlic, soy sauce and honey in a jug and whisk to combine. Preheat the oil in a wok over high heat. Thinly slice the zucchini, carrot and capsicum. Chop the pak choy into 2cm wide pieces. Fry the salmon for 3 minutes on each side. Remove to a plate. Add the veggies and noodles to the wok. Add the sauce to the wok, and stirfry for 6 minutes over high heat. Flake the salmon into pieces with a fork. Put the salmon pieces into the wok and coat with the sauce. You’re welcome, so glad you enjoyed it! We made this for dinner and it was delicious!! Thanks Stacey! It’s a midweek winner here. I’m not a salmon eater, but this looks like such a vibrant and healthy dish! I’ll have to make it for family!